Free extended warranty on your Xerox printers and multifunction machines. Yeah, you read that correctly. Click on the “How it Works” image below to get the gritty details of what is involved in getting you back to printing with no worries in regards to your toner or surprise service costs on your printers and multifunction office machines. You don’t even have to count your toner or be down without toner ever again. The days of hopelessly waiting for the delivery driver to bring your toner are now over. Follow the steps and screen shots below to earn a FREE Xerox warranty for your trusted Xerox printers, copiers and multifunction office machines. In addition to a free Xerox warranty reward with the Doc Jams Xerox Supplies Assistant, you can also make sure you never run out of toner again. 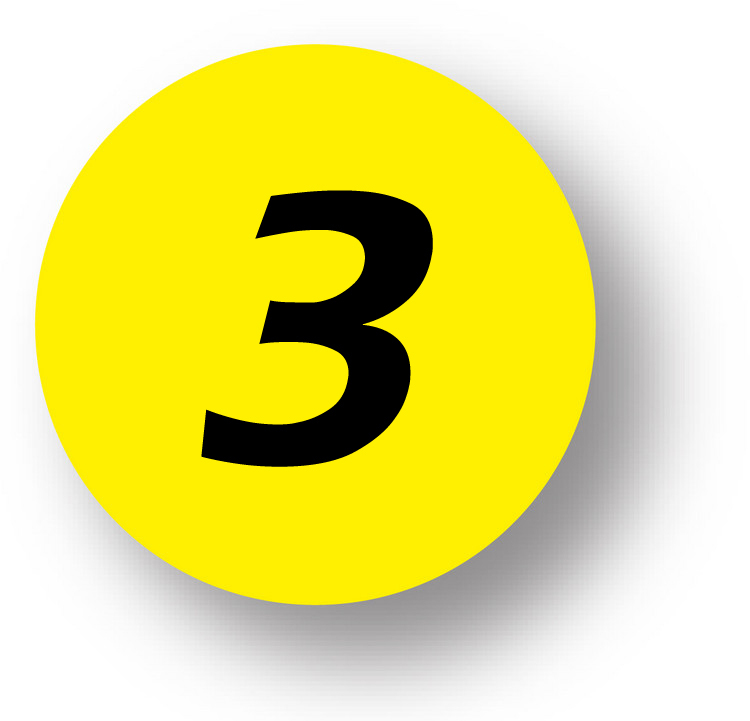 Follow the 3 steps below to get your toner supply closet in order in less than 7 minutes. 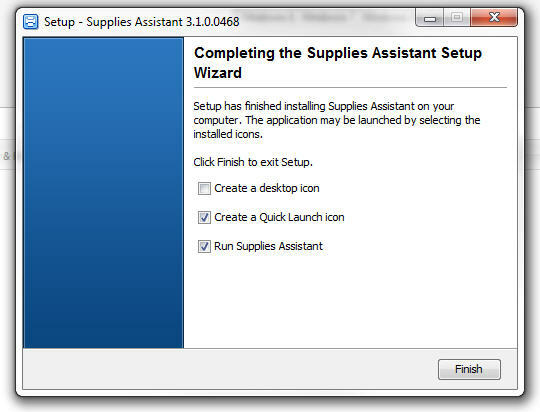 Download the Supplies Assistant here if you are already registered. 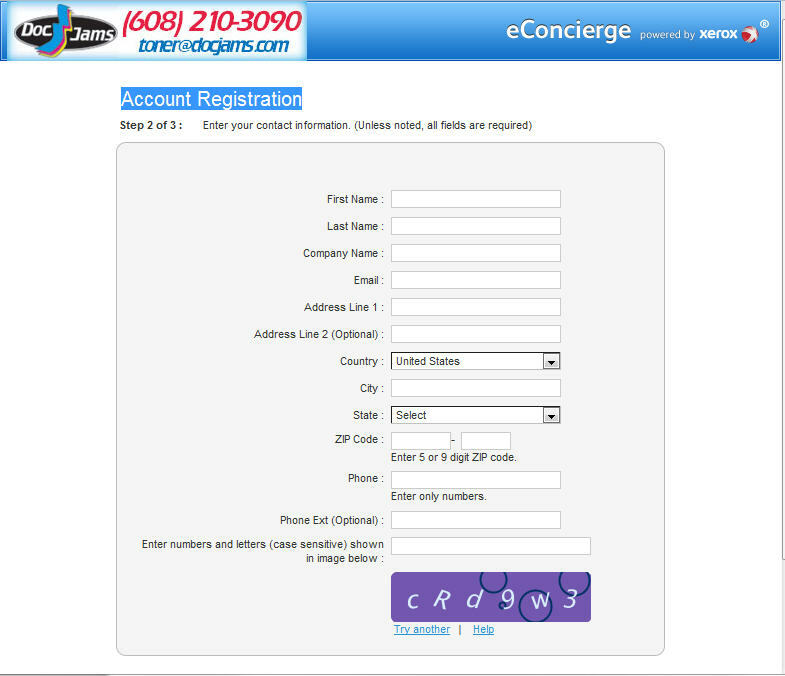 Click this link to create a User ID and Password. 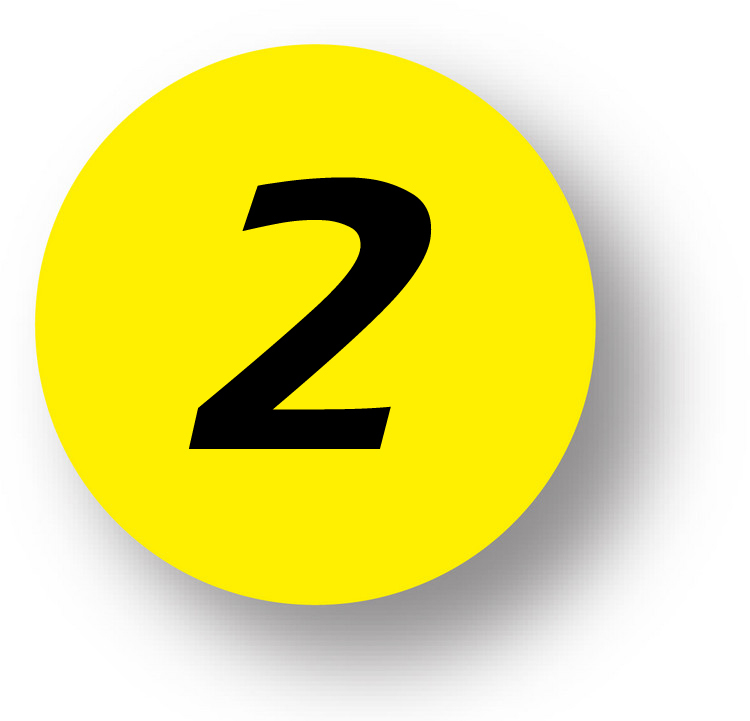 You’ll want to make sure that you remember the User ID and Password for a later step. If you do forget your password, you can always have it reset. Here you will enter your company information including the billing and shipping addresses for your toner and printer supply orders. This will lead you to the download link. You can choose your operating system from the drop down menu. 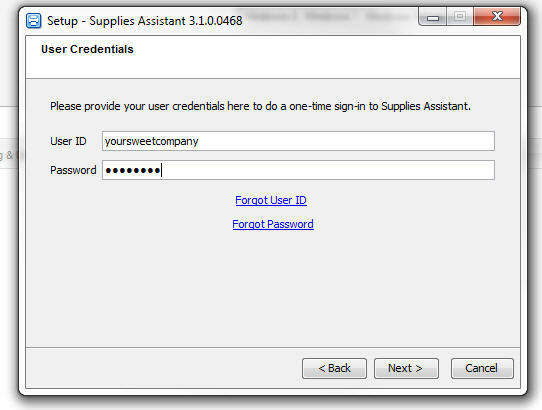 Save the Supplies Assistant Software to the computer of the person that takes care of ordering your toner. 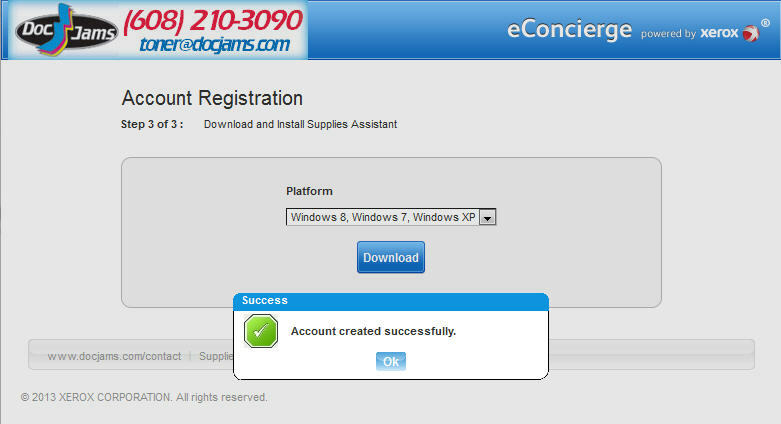 You can download the Supplies Assistant to the person in your office that takes care of ordering the printer toner, ink and printer supplies for all of your printers, fax machines and copiers. 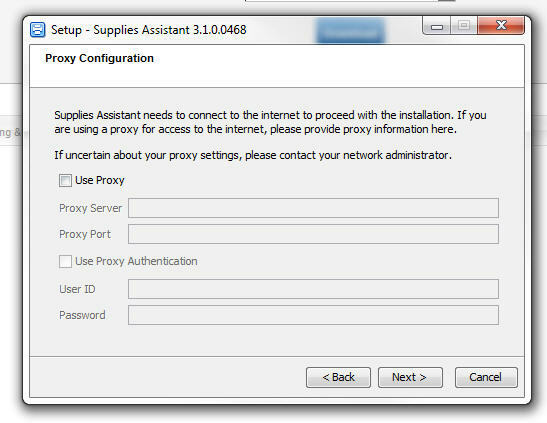 Save the Xerox Supplies Assistant on your computer. 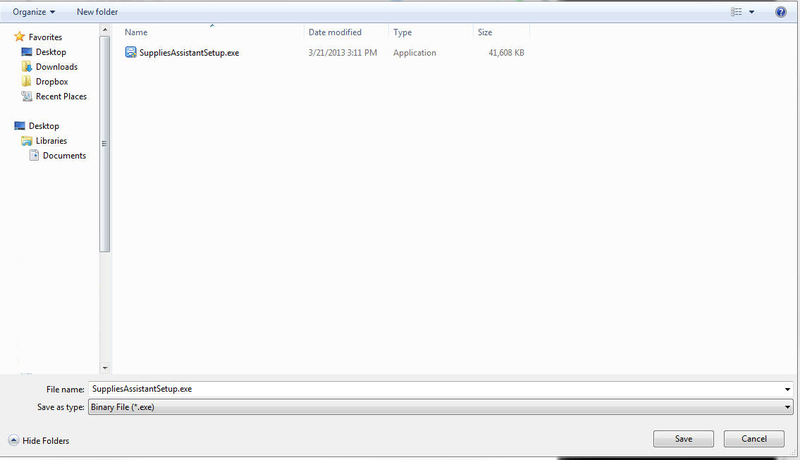 After saving the Xerox Supplies Assistant, it will begin installing. 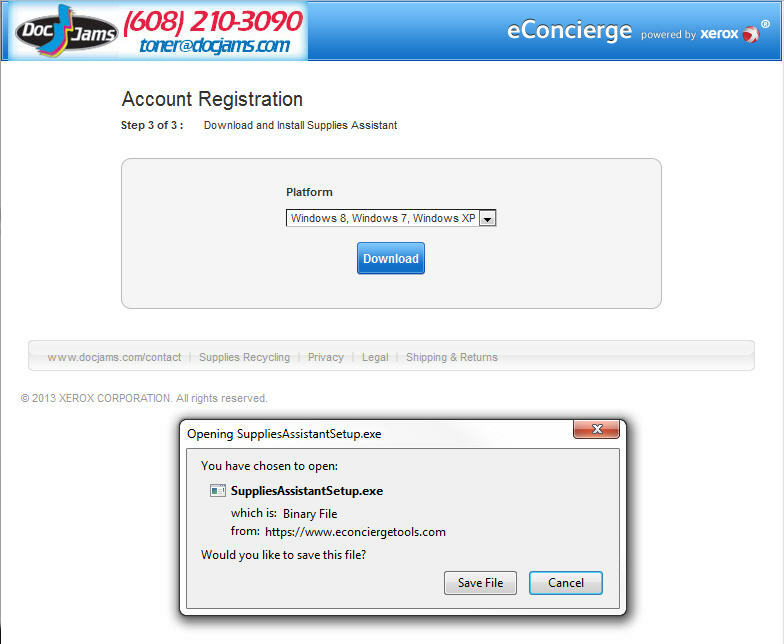 You may be prompted by your operating system or virus software to make sure you want to install this software. Just click “Yes” or “Next” as needed. Click OK if you can read English. 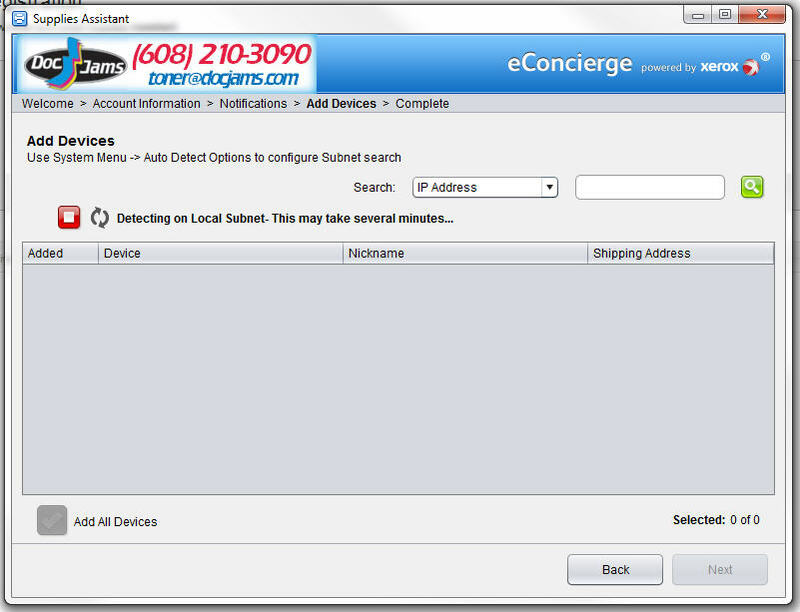 Proxy configuration may be needed for large companies. You can likely just click “Next”. 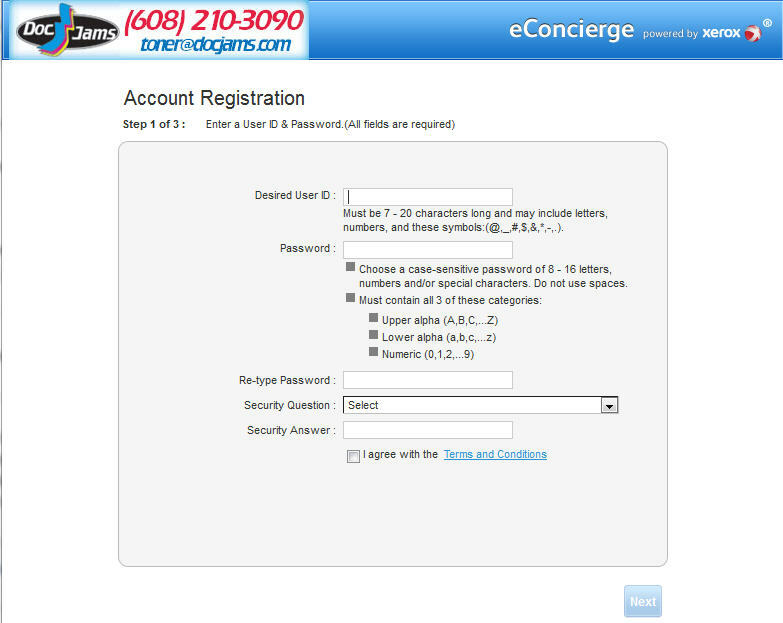 Enter your company User ID and Password you created at the beginning. Set your preferences for icons. Run the Supplies Assistant to be on your way to toner bliss and free Xerox warranty fun! 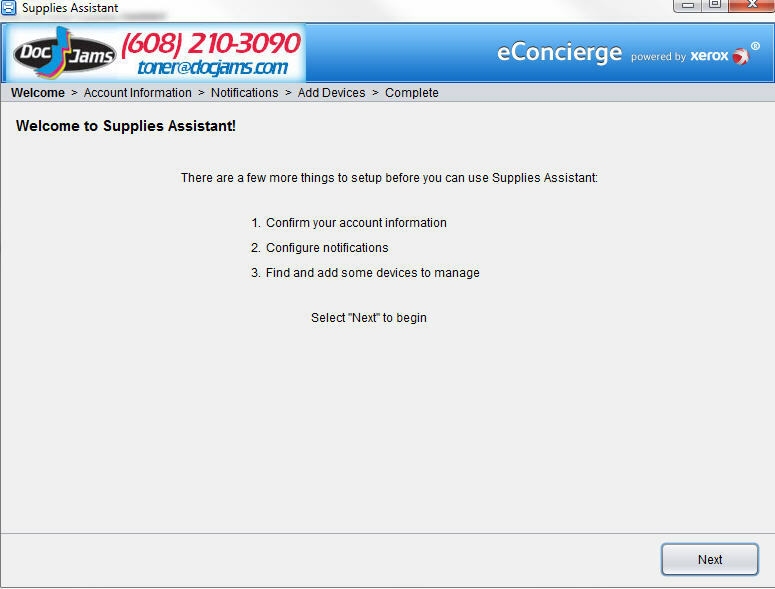 You can run the Supplies Assistant right away to automatically detect all of your networked office machines. 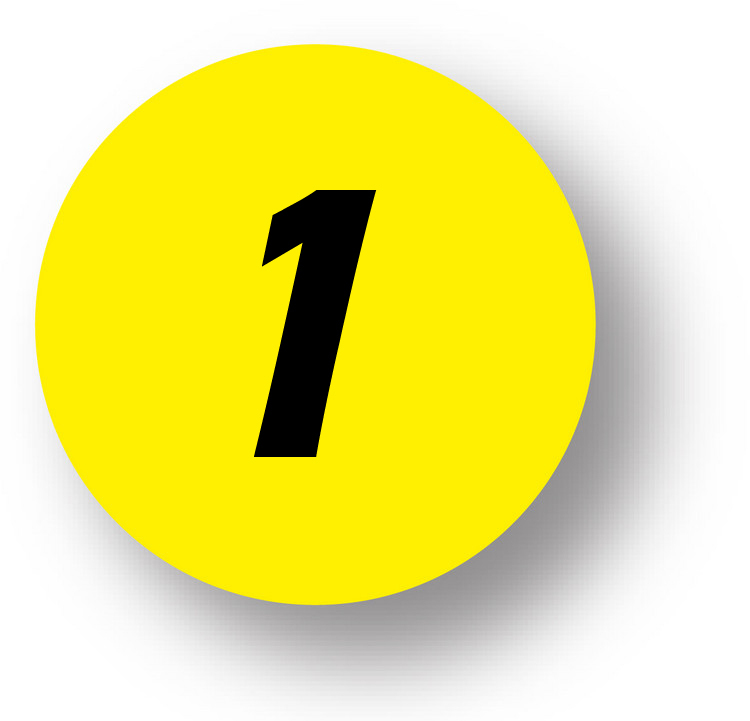 This keeps track of all of your ink and toner and other printer supplies all in one easy place. 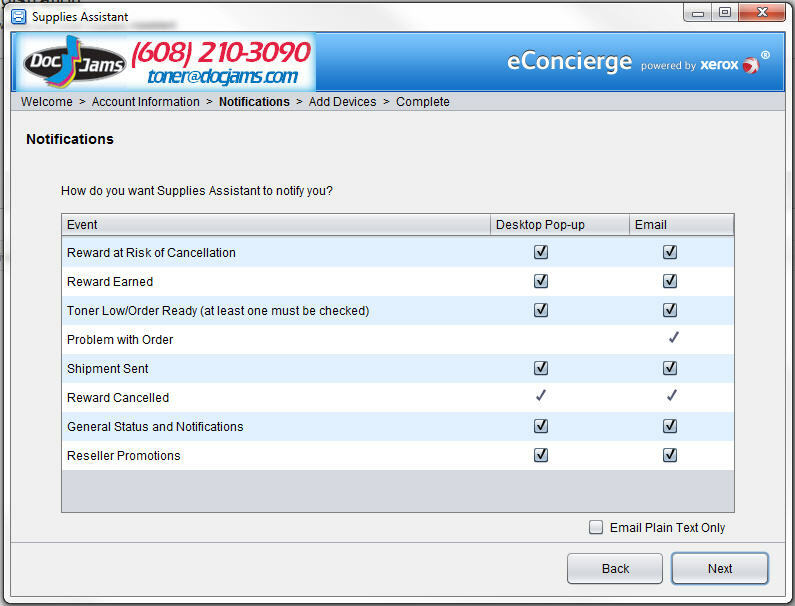 Here you choose how you would like to be notified of low toner, printer issues and your Xerox reward. The Xerox reward is your Free Warranty. Now the software will detect what machines are on your network. You can nickname the machines if you would like. 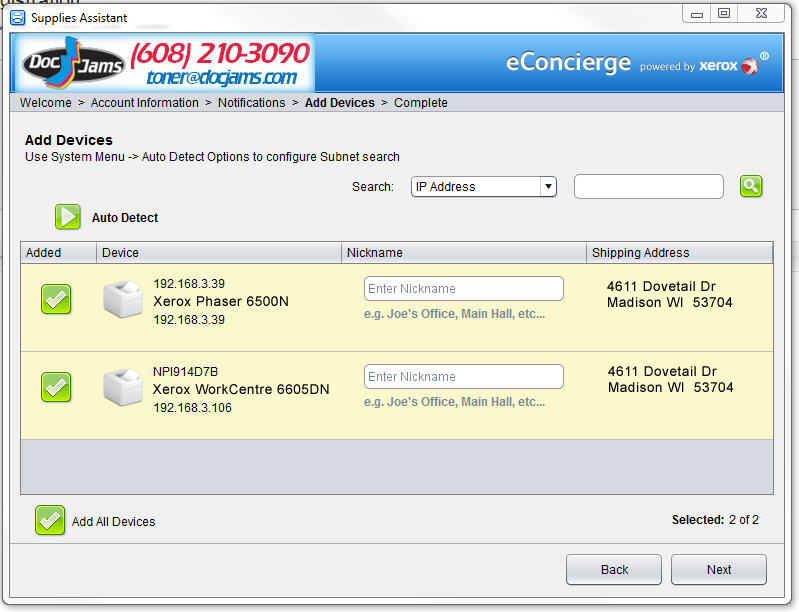 You can also choose which printers are monitored. 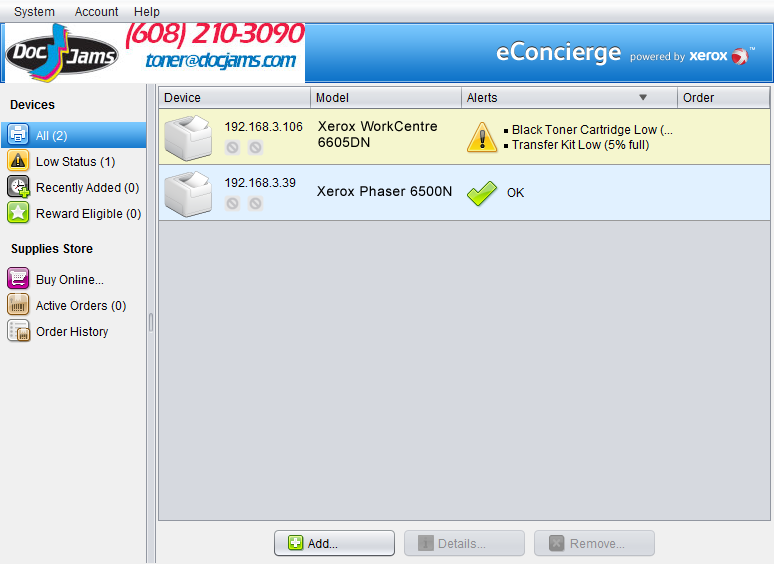 You can then see messages and status for your printers. You are now on your way to office bliss with control on your toner! 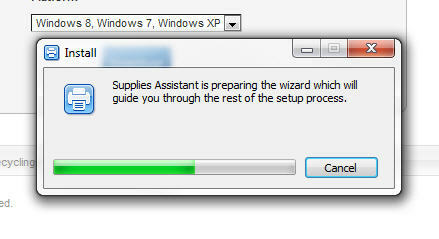 Download the Supplies Assistant here if you already registered.